The greatest power known to mankind is at your fingertips, and you are on the cusp of discovering its most valuable secrets. You have gathered with a society of intrepid, like-minded students of the art of alchemy, and each of you works tirelessly to become the first to discover the secrets of creating gold from base ingredients. However, only one of you can be first, and while you exchange knowledge and formulas, you always have one eye on the alchemist in the next lab, suspicious of his aims. Perhaps his new formula is as innocent as it sounds, and perhaps it is a poison unlike any yet discovered. 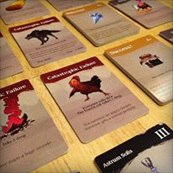 Red Phoenix of the Alchemists is a strategic card game where you will need more than luck to win; you will need to manage risk and out-think your opponents. You can trade knowledge with other players to help each other or fight against them. What matters is making sure you further your own goals, while trying to keep other players from meeting theirs. In Red Phoenix of the alchemists, you control your own fate. Artwork for the game is by the exceptionally skilled Cory Trego-Erdner, a professional fantasy artist whose work has appeared in many high-end publications including the 5th Ed. D&D Monster Manual. While Red Phoenix of the Alchemists is still in development, Techno Fight Games is currently exploring publication options after significant positive feedback from a broad range of playtesters. If you want to know how RPA will be published when the time comes, please sign up for the mailing list or follow the game on Facebook or Twitter. Are you a publisher who is interested in discussing how to get the game into the hands of excited fans? Please contact Techno Fight Games. For now the best way to help is to sign up for the mailing list and like it on Facebook so you can learn when the game goes on Kickstarter. Be the first to know when Red Phoenix goes live on Kickstarter! Techno Fight Games is a game design studio in Durham, NC run by Jacob Geib-Rosch. The goal is simple: produce beautiful games that people love to play. And have fun doing it.